Learn how to create beautiful arrangements of homegrown organic flowers at a lecture and demonstration workshop offered by the Center for Agroecology and Sustainable Food Systems and the Friends of the UCSC Farm & Garden. 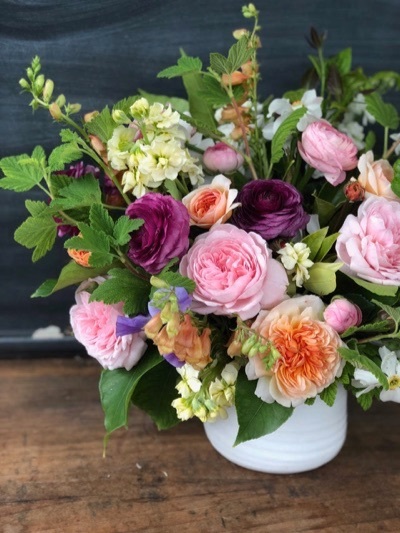 The workshop, "Grow Your Own: Selecting, Growing, and Arranging Your Backyard Bouquet," will take place on Sunday, July 15, from 9:30 a.m. to 1 p.m. at the Alan Chadwick Garden on campus. Orin Martin, manager of the Chadwick Garden, will be joined by his daughter Caroline Martin, owner of Wild Moon Flowers, for this workshop that will focus on how to select a range of blooms and grow them organically. Orin will discuss the many varieties of plants that can generate year-round blossoms in your yard, and Caroline will demonstrate the basic steps and principles used to create your own bouquets. Cost for those who register in advance is $30 general admission; $20 for Friends of the Farm & Garden members, and certified UC Master Gardeners; $15 for beginning farmers and limited-income participants; $5 for UCSC students. Register online at tinyurl.com/2018workshops. Cost on the day of the workshop, payable by cash or check only, is: $40 for general public; $30 for Friends of the Farm & Garden members; UC Master Gardeners; $25 for beginning farmers and limited income participants; $5 for UCSC students. Free public parking is available in the Merrill College parking lot. Additional paid parking is available at the Stevenson College parking lot. For more information, call (831) 459-3240 or email casfs@ucsc.edu.